Reading Room Cliffs Notes is the essential guide to what's going on in the Reading Room for the upcoming week. "Flashback" captures a highlight from last week, while "Foreshadowing" lists the upcoming week's events. Make a visit to the Bryant Park Reading Room presented by HSBC a plot point in your week! 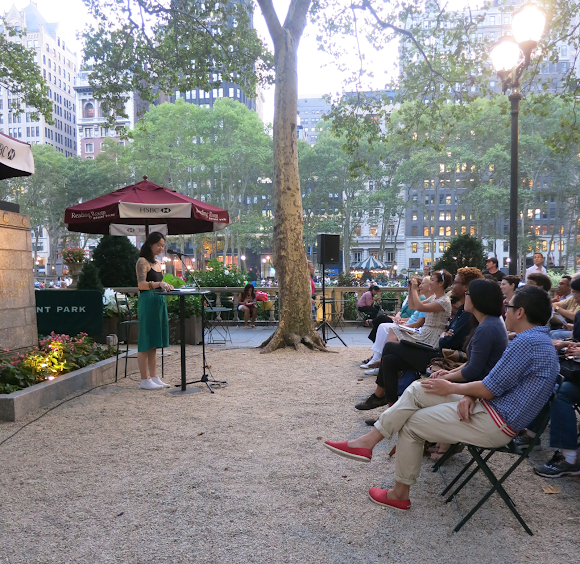 Wendy Xu reads from her her new book, You Are Not Dead. While most of the 2015 Reading Room programs have come to an end, we still have another month of Poetry to look forward to! Starting off the September poetry month were the contemporary Asian American Poets of Kundiman. The reading featured Lo Kwa Mei-en, whose first book Yearling won the 2013 Kundiman Poetry Prize and Rickey Laurentiis, winner of the 2014 Cave Canem Poetry Prize. While Laurentiis's book, Boy with Thorn, doesn't come out until Fall 2015 we were lucky to receive some early copies that sold out before they even hit the table.